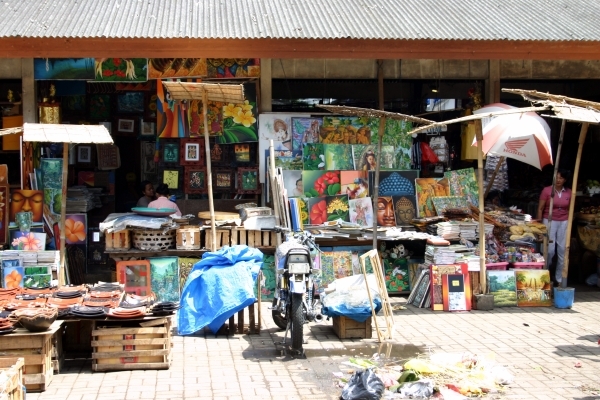 In the center of Ubud, where Monkey Forest Road meets Jalan Raya, is Ubud's extensive Art Market, known locally as Pasar Seni. This market is actually Ubud's main market. A bit of the old market for fresh produce can still be seen off to one side. The market sells a wide range of clothing, fabrics, masks and souvenirs. You can also find silver, batiks and paintings in various styles. The silver quality can be less than desirable, but prices are quite cheap. For 'finer' art, you'll find galleries all over Ubud, especially going south along Monkey Forest Road and west along Jalan Raya. To get an idea of what "real" Balinese art is, consider visiting one of the excellent art museums around Ubud.